Sequel to the 2010 DreamWorks Animation hit about a boy (in a Viking world) who befriends a dragon. This computer animated film picks up five years after the end of the original; with Vikings now living peacefully with dragons, until a new enemy emerges (threatening to destroy the peace). It was directed and written by Dean DeBlois (who also co-directed and co-wrote the first movie) and it's once again based on the book series (of the same name) by Cressida Cowell. Jay Baruchel, Gerard Butler, America Ferrera, Craig Ferguson, Jonah Hill, Christopher Mintz-Plasse, Kristen Wiig and T.J. Miller all return as voices; with Cate Blanchett, Djimon Hounsou and Kit Harington all joining the cast. I don't think it's quite as good as the original movie (or as well made as a lot of the overly enthusiastic fan reviews, I've read, have proclaimed it to be) but it is a good movie. Baruchel once again stars as Hiccup; who now spends most of his time exploring the skies with his dragon, Toothless (Randy Thom). The rest of the island of Berk now lives in peace with dragons, sharing food and enjoying dragon races. On one of Hiccup's adventures he, and Toothless, come across multiple angry dragon trappers, led by Eret (Harington), who blame them for a recent attack on their fort (in which dragons were stolen from them). 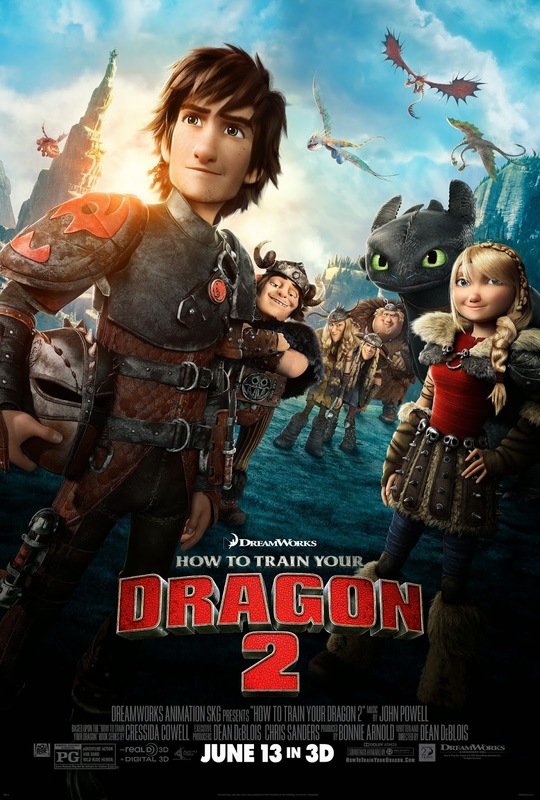 The duo, with the help of Astrid (Ferrera) and her dragon Stormfly, learn that Eret, and his team, are capturing dragons for a ruthless dragon hunter named Drago (Hounsou). They warn Hiccup's father, Stoick (Butler), about Drago but he just wants to prepare for war (where as Hiccup would rather try to reason with Drago). Hiccup and Toothless fly off to try and stop the potential war and also come across a mysterious dragon rider, named Valka (Blanchett), while doing so. Once again the visuals look beautiful (like the original film) and the dragon riding scenes are breathtaking. The movie is darker and a tad more violent (I'd say) this time. I saw it with my two young nephews (Eugene and Justin) and I think they both really enjoyed it; it might have been a little too scary for my youngest nephew (who's 6) at times though. There are some lighter comedic moments, throughout the movie, but a lot of those feel forced (although the dragon humor is always funny). The dragon bonding scenes continue to remind me of my relationship with my best friend Keno (my cat). The film does lack some of the awe and wonder that made the original movie so special though. It does a good job of building on it's mythical world (it established in the original film) but the character development isn't nearly as well played out (this time). With all of it's flaws it's still a better animated family adventure film than most. I'd definitely still recommend it.